Smarties, I am excited and honored to introduce you to my good friend and this week’s Smarty Mom, Aimee Bucci. Aimee encompasses all things “Smarty.” She is an amazing mom, an amazing daughter, an amazing sister and an amazing friend. She has incredible wit and is genius level smart. Late night conversations over a bottle of wine are incredibly fun. The topics range from swim lessons (or lack there of) to Martin Luther nailing his 95 theses to the castle door. She is my kind of people. What I love most, Aimee does not compromise her true self for anyone. She has a huge heart and her honesty is refreshing. She is the real deal. Everybody should have an Aimee in her life! I decided to structure this interview around Aimee’s recent family vacation and as you start reading the paragraph below you will see why…. *remember, I love conversations with Aimee and this one I felt needed to be shared with YOU, our Smarty audience. 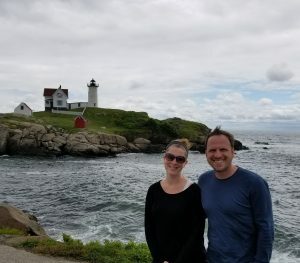 Disney Cruise vs. Trip to Maine – yes, Aimee – I went there. You see Smarties, Aimee and I both go to Maine during the summer…. it is our Happy place. 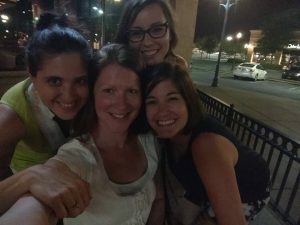 It was our instant connection when we met at the Blakeney Splash pad 3 years ago. Earlier this week, she told me her recent Disney Cruise Vacation was magical – the best family vacay EVER. So, I am curious how something SO incredibly different from our happy place could be so Magical! 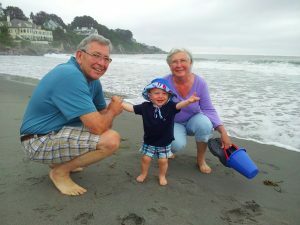 A summer in Maine is about being unstructured – living on “Maine” time – back to the basics, good old fashion outdoor fun! Commercialism is frowned upon. Disney, on the other hand, is structured, full of themes and overflowing with commercialism. 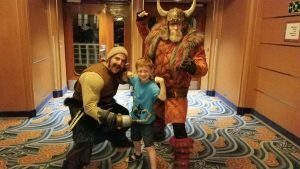 So, when my “Maine” friend told me her Disney cruise was the best family vacation EVER, I was intrigued and needed to find out more…. When did you start planning your Disney Cruise? My parents started talking about it about last summer after their friends got back from a Disney Cruise. I got online and found a ton of information really easily. We decided to go with Marvel Day at Sea so that my son would have superheros and my daughter could have Princesses. We hit the jackpot because the Marvel Cruises are on the Magic (one of Disney’s smaller ships) which highlights Rapunzel who is my daughter’s favorite. While we started thinking about it early, we didn’t actually book the trip until February, about 3 months before sailing. 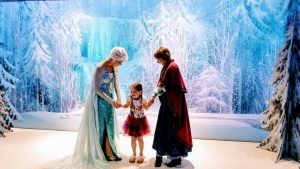 Why did you choose a Disney Cruise over visiting a Disney Theme Park? Have you ever heard parents say that traveling with kids is a trip and not a vacation? Well, we wanted a vacation! No lines, no fast passes, no need to talk miles and miles every day. We got all the fun and magic of Disney is a relaxing, set your own pace environment on the cruise. Have you taken a cruise before? Yes, once when I was 14. My parents cruise a lot but this was everyone’s first Disney Cruise. Sample day on the ship? There was so much to do that every day was different! There is an app and a printed Navigator that list everything going on from 8 am to midnight. We usually did the buffet breakfast (fret not nervous mamas- there are soap and water hand washing stations outside the buffet and a super friendly Disney employee standing there to gently remind everyone to wash up! 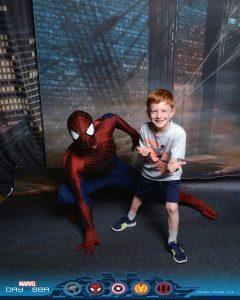 ), and then headed off to an activity like a Marvel Beginnings show or character meet and greets. Then we’d do some family swimming and feed the kids poolside. There are lots of tables and several different food options to make everyone happy right there in the middle of the action! Then we’d drop the kids off at the Oceaneer’s Club so the adults could sit in the adults only pool area and enjoy a quiet cocktail and chat or read. Although the kids were always sad to get picked up, we’d take them back to the room for a little down time and showers before heading to the evening show. Since my kids are generally early to bed kids, we opted for the second seating for dinner which is at 8:15 pm. This sounds crazy but because we picked the later dinner- we got the early show! I wanted my kids to have the memories and I figured they’d remember the shows over dinner. This was the best choice! We grabbed an early light dinner before heading to the 6 pm shows which were AMAZING. The talented performers, the productions, costumes, lighting- everything was the highest quality. My kids were memorized! Declan even got called onto stage during the Dr. Strange show! After the show we wandered a bit, our favorite was playing ping pong and Foosball up on Deck 10, and then we went to dinner. If there was one person who made our cruise outstanding- it was our waiter! More on that to come. After dinner we ended up all going to bed because we were so tired! My one regret is that I never got to any of the after hours lounges and late night fun. Everything! My kids both loved the kid’s clubs with their own activities like a visit from Doc McStuffins and Marvel superheros, dodgeball, arts and crafts, etc. Oh, and if your kids are there during meal time- they feed them right there! There was a fun pool with a giant screen playing movies. There were so many dance parties (a family favorite), character meet and greets- some you waited in line, others you get tickets for (get the tickets! 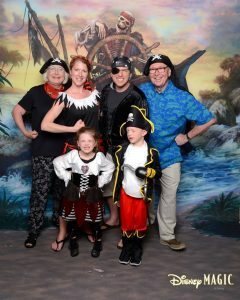 ), There are fun shows when you sail away, and during Pirate Night. I could go on and on. I also noticed that they had great activities for different age groups. The tweens did a flash mob which seemed really fun and there was even an 1820 club for 18 to 20 years olds. Disney really thought of everything! At this stage of parenting, a cosmos by the quite pool was all I needed! Even better was laying in the hammock under the palm trees while my kids played in the soft white sand on Castaway Cay. Paradise. But there was a ton to do- different music events, trivia, $10,000 bingo. No one could ever be bored! I am so grateful for Disney and their attention to dietary needs! I have both a gluten and lactose intolerance so I was worried about feeling a little left out! From the first meal, everyone went out of their way to make sure I had delicious, safe food. While the regular menus had both gluten and dairy free options, there were only a few items that were both. However, our waiter Richard would bring me the next day’s menus so I could order ahead. I could choose whatever I wanted and they made it special to meet my needs. And the food was so good. They even brought me my own dessert every night! One day at the buffet I requested a lunch time dessert (don’t judge- it was vacation!) and a supervisor came to oversee that it was made safely. Same thing at the pizzeria- you can request gluten free pizza and they bring someone to supervise. When we went to Castaway Cay, they sent a special meal ashore for me as well. I felt totally safe and so appreciative! For the rest of the family, everyone was thrilled with the food. And our waiter, as I mentioned before, somehow kept my children entertained and happy through a late, long dinner every night! The adults drank wine and ate 3 courses while Richard made sure the kids’ food arrived quickly, gave them puzzles and game and most of all, made us all feel comfortable and happy. Talk about Magic! All of it. And you know me Jenni- I have high standards! During our dinner at Rapunzel’s, she comes walking through and my daughter was bouncing in her seat waving and smiling. Rapunzel stopped, smiled directly at her and waved. Caelyn looked and me and said, “Mom, she recognized me!” Later Rapunzel and Flynn Rider went to every table to talked to us all. Just the absolute magic of making princesses real to my daughter made me melt. Another favorite moment was Pirates IN the Caribbean. Yes, we all dressed up and it was so worth it! There were pirate activities all day and then a deck party complete with fireworks! It just amazed me that all of us, from the kids to the grandparents, had the best time the entire time! What did you pack? What were your essentials? For you – A pirate costume 🙂 All the things you’d think- bathing suits, comfortable clothes. I liked to wear something a little nicer to dinner but things are not really dressy unless you do a longer cruise with a formal night. My tip though is to mix your items up between suitcases so you have some clothes for everyone in every bag. Getting to the ship was a breeze but 3 of 5 suitcases didn’t make our flight home. We would have been in big trouble if it was the other way around! For kids – costumes and character tshirts. My kids loved being a part of everything. I also bought each kid a journal and stickers (Marvel and Disney) so they would write/draw their memories! We flew to Miami where the cruise left from. We had 2 days at sea, a day in Grand Cayman and another in Castaway Cay. It was a 5 night cruise which was a great length. What makes Disney cruises different from others? I think Disney’s attention to detail and logistics. Disney knows kids and families! Disney knows how to keep kids happy and therefore make parents very happy! I think their staff was really amazing. Everyone was upbeat and helpful. Activities were seamless and always done really well. The caliber and quantity of the entertainment exceeded every expectation. The food was amazing- things that all kids eat like chicken nuggets, mac and cheese, hamburger, hot dogs, pizza, soft serve ice cream) but also salads and the best fresh fruit, sandwiches and wraps. And that’s just the self serve areas!. The restaurants are amazing! The only thing that was even a little frustrating was getting off the boat because it took a really long time to walk through everything and get through customs. Otherwise it felt like all of our needs and even wants were taken care of before we were even aware of them! I know Disney cruises are more expensive but it really felt like a ‘you get what you pay for’ situation. I am willing to pay more for this level of service and professionalism. 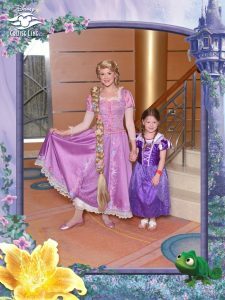 Are Disney cruises good for older kids/teens as well as the littles? There were a lot of older kids on the boat. They seemed to be having a great time. There were also clubs based on age- a nursery for the babies, another for 3 to 12 year olds, 11 to 14 and also 14 to 17 years. Each club had different activities throughout the day. The ship also felt very, very safe. The on board phone app also had a texting option so you could keep in contact or use the room phones (which I never needed to figure out). If you’re not a huge theme park person, will you still love (survive) a Disney cruise? That’s me! I’m not really a ride person and don’t love crowds and Declan gets motion sick easily (but he was fine on the cruise!) so the answer is ABSOLUTELY. What are some Disney cruise destinations? You name it! They leave from New York, Florida, California and go all over the Bahamas, Mexico, Alaska. There are Mediterranean cruises. I think there is a Disney Cruise out there for everyone! Where do you summer in Maine? Drive, mostly because we stay as long as we can. We do an overnight in Pennsylvania to break up the trip. Favorite thing to do with the kids in Maine. 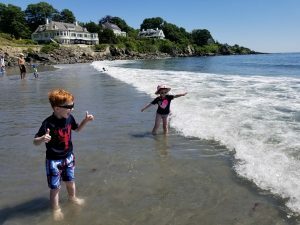 Go to the beach, get penny candy and ice cream at the Goldenrod, watch the waves crash at Nubble Lighthouse, hike Mount Agamenticus, get donuts at Congdons (and wish I could eat them) , play in the yard with the milder temperatures, makes smores by a campfire. We love to be outside all summer long! If you want Lobster in York, it’s got to be Off the Boat Lobsters but you eat it at home on the deck because lobster is messy!! But Foster’s Clambakes is great too. How many years have you been going to Maine. Since I was born! My parents bought a tiny log cabin in York when I was 8 years old. My parents now live there for half the year and here in Charlotte the other half (pretty sure they are the luckiest people on earth). Special places to go. I listed some of these in the things to do question. Also Dunne’s Ice Cream. We love Portsmouth, NH for walking around and even date night. Beach, beach, beach! Sand castles, flying kites. And also just hang out and be kids! Why you love to visit Maine? It’s beautiful! And peaceful and the pace in the summer is just right- not too fast, not too slow. My family is there. My kids get to spend time with their cousins. 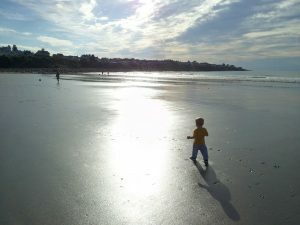 What are your plans for this summer in Maine- your bucket list for the summer. Now that he’s old enough, Declan is taking golf lessons at the country club with his cousin which is a big deal! Otherwise, all out usuals! How is packing for Maine different than packing for the cruise? 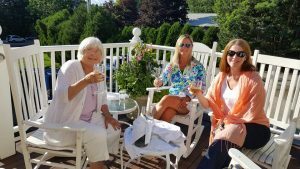 Does planning a Maine vacation require as much planning as a Disney cruise? 5 nights versus 5+ weeks is a different ball game entirely! Plus, in Maine we’ll need clothes for 50 to 90 degrees! How do you survive the drive with the kids? Do you like butter or mayo in your lobster roll? 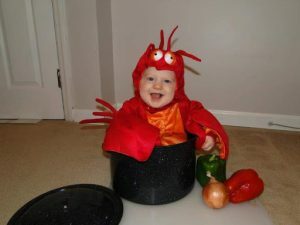 Do your kids like lobster? What is that one thing that you do EVERY summer you visit to Maine? 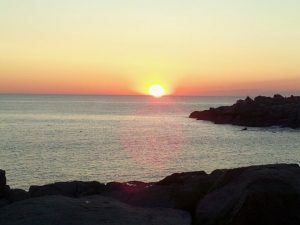 I have to catch one sun rise at Nubble Light. It’s VERY early up there because it’s so far east but I have to do it! Rocks. Although Castaway Cay (Disney Cruise location) had me thinking I might covert! * Smarties, Right here explains why Aimee and I are such good friends. Uh, Red Sox, duh. Always. Smarty Scoop soon to arrive!